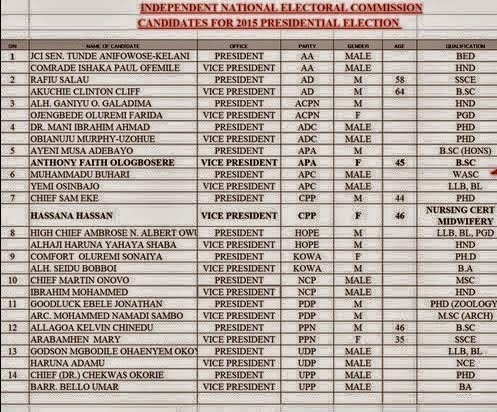 INEC yesterday released this spreadsheet detailing the educational qualifications of all 14 presidential aspirants and their vice presidential running mates. Buhari is listed as having a WASC, comparable to a WAEC/SSCE certificate. He however is said to have other military diplomas and certificates with the army. Prof Yemi Osinbajo has an LLB Law degree and a BL. President Jonathan has a PHD(Zoology) and vice president Sambo has a masters degree (Architecture) The female candidate, Oluremi Sonaiya has a Phd also, while her VP has a BA. Most of the candidates have first degrees, AD presidential candidate Rafiu Salau is the only other person, apart from Buhari who has an SSCE.